Aaron Cook Dot Com ™ - Life, Blogging, Money. 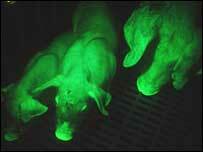 : Glowing Green Pigs Bred In Taiwan...What the?!? Glowing Green Pigs Bred In Taiwan??? Well, obvsously this doesn't have anything at all to do with MLM or Network Marketing. But with weird news like this, how can one resist? but at least three of them glow. Taiwanese researchers said Friday they have bred the pigs, all of them males, with a fluorescent material in a move they hope will benefit the island's stem cell research effort. The fluorescent pigs are green from inside out, including their hearts and internal organs, said Wu Shinn-Chih, assistant professor of animal science at the prestigious National Taiwan University. There are partially green pigs elsewhere in the world but the Taiwanese pigs are said to be the only ones that are green from inside out. From the outside, the pigs appear to be bathed in a light green tint, particularly their eyes, mouths and knuckles. 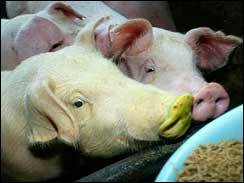 Wu said the pigs are bred by injecting their embryos with fluorescent green protein taken from jelly fish. "Only one in a hundred (injected embryos) will successfully be transgenic," Wu said. "When the embryo grows and becomes a pig, the pig will be fluorescent that glows in the dark." Wow, how bizarre. Glowing green pigs. Certainly brings a whole new meaning to the Dr. Seuss book Green Eggs and Ham! I just hope this type of genetic engineering doesn't lead to some bad things down the line, like other things have in the past. Guess we'll see!